The Akshaya Patra Foundation is set to launch eleven new kitchens in partnership with the Government of Uttar Pradesh. Lucknow, 26 December 2016: The Akshaya Patra Foundation is set to launch eleven new kitchens in partnership with the Government of Uttar Pradesh. 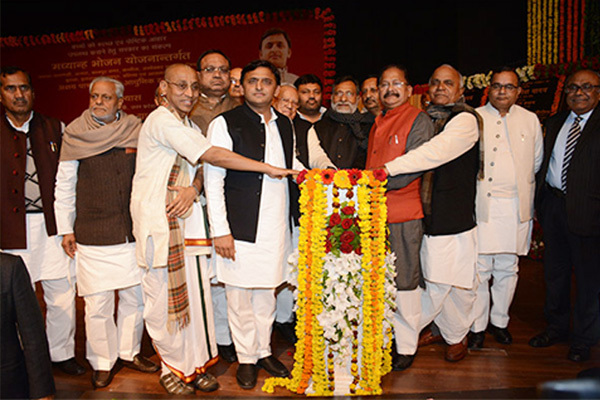 The Honourable Chief Minister of Uttar Pradesh, Shri Akhilesh Yadav announced the setting up of eleven new kitchens with the ‘Shilanyas’ (Ground Breaking Ceremony) on 26 December 2016 at Lok Bhavan, New Secretariat - Lucknow. These kitchens will start providing mid-day meals to children in the next academic year and increase the reach to over 1 lakh children per kitchen every day in due course. There were a host of dignitaries present at the occasion including Shri Ahmad Hasan – Cabinet Minister for Basic Education, Shri Kailash Chourasiya - Minister for Women & Child Welfare, Shri Wasim Ahmed - Minister for Child Development & Nutrition, Primary Education and Energy, Shri Rajendra Choudhury – Cabinet Minister for Political Pension, Shri Ram Govind Choudhury - Minister for Panchayat Raj, Shri Pradeep Mathur - MLA, Mathura constituency, Shri Alok Ranjan - Chief Advisor to Shri Akhilesh Yadav, Shri Rahul Bhatnagar - Chief Secretary, Shri Ajay Kumar Singh - Secretary, Basic Education, Shri Chanchalapathi Dasa, Vice Chairman- The Akshaya Patra Foundation and Shri Suvyakta Narasimha Dasa - President, The Akshaya Patra Foundation, UP. 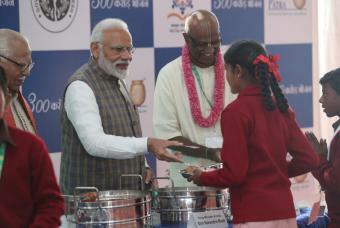 Akshaya Patra is currently feeding 1,05,000 children from its Vrindavan kitchen and 66,000 children from the Lucknow kitchen (which was inaugurated by Shri Akhilesh Yadav on 15 March, 2015), totalling to 1,71,000 children across 3021 schools in Uttar Pradesh. With the introduction of these new 11 kitchens, the reach will be expanded to serving more than 13 lakh or 1.3 million beneficiaries per day, which makes this the Foundation’s largest intervention in India. The districts where the eleven new kitchens will be constructed are Varanasi, Ghaziabad, Agra, Allahabad, Kanpur, Etawah, Kannauj, Ambedkar Nagar, Azamgarh, Rampur and Ballia. It was a landmark event in which the groundbreaking ceremony for establishing all the eleven centralised kitchens was observed simultaneously, signalling the delivery of better nutrition, better education and a better future for the beneficiaries. About The Akshaya Patra Foundation: The Akshaya Patra Foundation is a not-for-profit organisation headquartered in Bengaluru, India. The organisation strives to fight issues like hunger and malnutrition in India. By implementing the Mid-Day Meal Scheme in Government schools and Government aided schools, The Akshaya Patra Foundation aims not only to fight hunger but also to bring children to school.